A Man , A Beer , A Brawlfest ! Garbage ... Good as GOLD ! Over 2 days had passed since I'd been to the "Brawlfest" ( that's how my friends like Alicia the founder of DEH Singapore ( Desperate Expat Housewives ) and I nicely call the recent Beerfest 2010 here in Singapore ) It was a gathering of people from all walks of life having a mixture of reasons for coming over to the event. Either to watch the on-going football games on the big screens, watch the skimpy clad ladies walking & parading all over the place, listen to various guest bands performing everynight, to simply savouring the wide variety of beers the venue was meant for or to just simply narrow down to their main goal of creating nuisance to attract public attention . A lot of people are mostly proffesionals , expats and can afford the prices no matter what. I was just extremely surprised with the behaviours some of the white foreign men were capable of doing. I'm 45 years old. I don't drink alcohol and watch over my drinking friends and husband all the time. They call me an angel for taking care of them and sending home coz I drive all the time. I'm a reliable storyteller everytime a party is over coz I'm forever sober ( coke, ice tea or If I get lucky I can get coffee ! ) and I see everything that happens... simply every single thing ! I could tell the most minute details no matter what coz I see everything happening right infront and at the back of me ... the whole nine yards. The beerfest is such a huge event were people get down to the last drop of beer. Sometimes, the beer is still pouring but the man itself is alreaday down . Tsk-tsk. It happens a lot of times anywhere. There's nothing unusual about that. What's so unnatural during the beerfest was the group of foreign expat males standing on the table, shaking their cans of beer and spraying the people dancing and watching the Hells Belles ( American Female Band version of ACDC ). They happened to be just right behind me and my Australian friend Karen. Yes they're having fun ... no one bothers to try and say anything against them coz they're big enough to scare the locals and other foreigners to respective corners. Especially the women. Karen was wet all over her back , my hair was soaking in beer but we can't move away from our position coz we're both short and standing , tip-toeing on chairs just to see the Hells Bells Performance infront of us. Our husbands were on the other side of the table infront drinking and dancing. These guys behind us , 5 of them in total but 2 of them are ok and gentle with one just right behind me offered to take a picture of me. See this shot ? He took a pic of me with my camera . Nice guy I said to myself. Althoug the 3rd one beside him who was sporting a heavily tattoed shoulder down to his elbow ( he thinks he's super cool dude ! ) plus the other 2 are getting even more wild throwing big ice cubes from the buckets of Jaz Beer to peoples' heads on the dance floor. I saw a young caucasian lady got hit on the forehead real hard and few guys hit randomly. What a pity ! Karen made a move and said to one of them to just drink the beer and don't waste it ~ in a nice way. The guys just laughed at her ( typical a-holes ) and moment she turned around, the guy behind me in his black formal long sleeve shirt ( such a formal office guy looking person you won't expect to do anything wrong ! ) started shaking his beer can and opened it behind the 2 of us. My mind flipped seeing a new splash is coming and seeing they just don't give a damn and won't stop at all. So I tapped his hand and said " Hey, 1 time, 2 times , 3 times to ask you to stop is more than enough ok ? His can went flying off his hand. When I turned around to watch the concert again, the guy just pushed me so hard that I went crashing on top of the table full of bottles and glasses infront of me. What the #$@ is this guy doing laying his hands on me ? I got on my feet in seconds, and went up the chair again and went right straight to him with a push ... he went flying on the next table behind him. Big hell broke when his friends helped him up and he got up to punch me . He brushed aside Karen who was standing on a chair blocking his way. Karen fell crashing backwards on top of the table and he ran towards me . I'd readied myself to fight back and was quick enough to give him an upper kick on his stomach ( lucky i was wearing my denim pants & loafers and not stilletoes! ) and he went crashing back to where he came from. That's the time our husbands saw the commotion. Karen's husband seeing her getting up from the table immediately drew punches on the guy's face. OMG! It was a horrific scenario to see our drunken hubbies getting into the fight too . My hubby couldn't even stand straight coz he was already very drunk and I was afraid our opponents' hooligan friends might join the brawl and punch him & Peter too. Even bigger trouble. I was yelling at him to go on the side and assured him that I can defend myself against the guy. Lucky the other hooligans just stood and watched us . The tattoed guy was laughing while his friend was getting mauled. Anyway, security finally came after Alicia had been frantically screaming security ... security ! 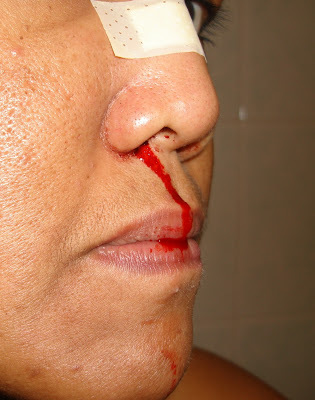 But the guy still got his eye on me despite of his bruised face with cuts on his eyebrows and nose. I managed to give him 2 hits of beer bottles on his head ( the bottles just bounced off his head one after the other ~ good quality Corona bottles I should say ... tsk-tsk ! ) distant punches from me and my American friend Akicia before he tried to escape from us . As soon as he looked for cover in the crowd, I chased him and told him he's a coward who could only pick on helpless women and could only fight behind our backs. Now face to face with someone sober like me and with other men & women around, he was running away for his safety and shielding himself among the crowd. Shame on him ! Suddenly, a punch from my right side landed on my face. So hard that I was totally knocked over and fell to the ground . I saw everything cloudy white. I felt like I was instantly blind ! But my immediate reaction was to stand and watch out for anything else coming. ( Lucky I had watched J'Lo's movie about self-defence on how to react when someone knocks you down ). To get on your feet as soon as possible ! I was dizzy and my nose was bleeding heavily. Who the hell was that ? One of the hooligans had hit me on my right side of the face just below my right eye. Too bad I din't see who exactly that guy is. Karen just told me later in the First Aid tent that she saw the guy who sneaked from behind and punched me. She had kicked the guy who punched my face after seeing that I fell on my back and he was ready to kick me when I was getting up. Can you visualize what kind of man this guy is ? How can he do that to a woman like me when I don't even have anything to do with him ? Probably, he just wanted his friend to be able to run and escape from the crowd coz his friend had already been mauled enough by my friends. But still, why punch me ? He can just push me or pull my pony-tailed hair to stop me from chasing his friend . Oh well ... what an experience for me ~ my ever 1st night in a Brawlfest ! The security didn't do their job well enough to help the victims just like me.They didn't even have the guts to keep the guy who attacked me . They let him and his bunch of footy friends go and roam around free ! I was scampering to pull my husband to the side for safety while my face was covered in blood and this one security staff even shoved me to the side which angered my husband even more. Saying you don't push a woman ... she's my wife .. she's bleeding! No one dared to assist me immediately that I need to grab a bucket of ice from the tables myself and soak my hands in there and wash my face with ice cold water. I put ice cubes on my face immediately coz I could feel my face was starting to swell. My face was numb that i didn't feel anything on it at all. 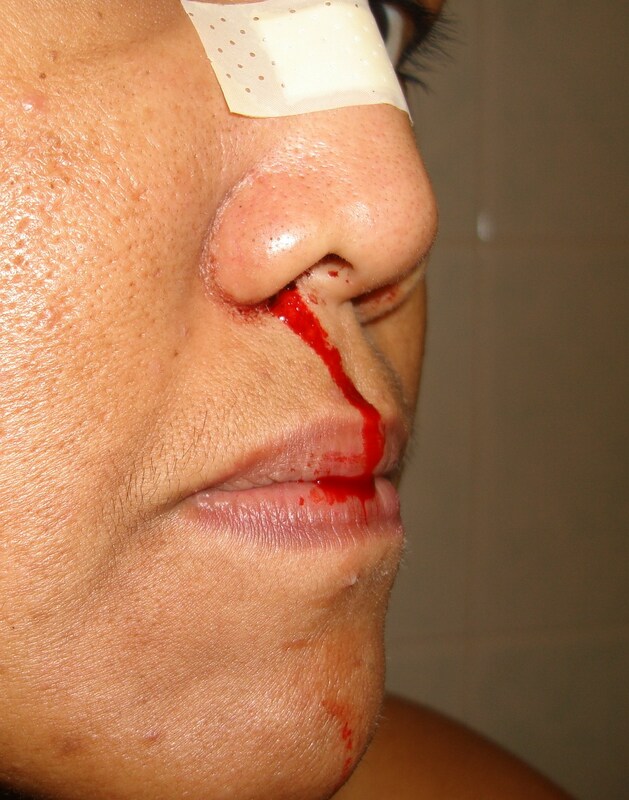 Not even feeling the bleeding cut on my nose ! I was so angry my whole body was feeling no pain despite of blood rushing out of my nose and I was already spitting clots of blood stucked from my throat. This is how these expats behave in a foreign land . Unfortunately, they had landed in Singapore. One of the best places in Asia. Such a shame that they considered themselves well educated but got no respect for women at all. Just for a lost can of beer, they can rip you apart , no mater who you are , whether male or female young or old. Just doesn't matter at all . Think about them ... How much more they can do in their own native homeland ? Singapore is now starting to become a haven for these type of maniacs. Security lapses had been so bad in so many ways the last few weeks and months. Not a good image for Singapore known to be the most safe country to live in Asia. Yes, Singapore is a beautiful country .. but would not be anymore soon if these kind of people gets well spoiled here. I had opened my email inbox a few days ago and found a message from an unknown source which captured my attention. It was sent by a lady all the way from Woodstock, Georgia ( USA ) walking in the Susan G. Komen 3-Day for the Cure this October in Atlanta. Her name is Carolyn. She needed support as she takes an amazing journey in the fight to end breast cancer! The Susan G. Komen 3-Day for the Cure is a 60-mile walk over the course of three days. Net proceeds from the Susan G. Komen 3-Day for the Cure™ are invested in breast cancer research and community programs. Carolyn is so proud to be walking in memory of her mother, Anne Forcier Watson. However, Carolyn needs some help ~ in fact, she's collecting donations of items that she may sell in order to help her reach her goal of $2,300 for the breast cancer fund. She'll be hosting a wine tasting event this coming July 17th with her good friends at Kingfisher Wineshop located in Woodstock, Georgia. Personally, I don't know her at all but I thoroughly read her message from top to bottom and was touched by her great commitment to the cause. It Doesn't Cost Anything to be Nice to People ! The day after I got the message from her, I started making some Wine Charms in relation to her wine tasting event next month. I got some spare Ring Holders ( normally used for cards but this time I'll make use of them as charm holders , why not ? ) , wire-wrapped some Celestial crystal rondelle beads with non tarnish silver beading wires and attached some metal charms with jumprings to the main ring holder. I made the wine charms in a set of 4 pieces with the combination of different colored crystals ( Sapphire Blue, Lt Topaz Brown, Clear Crystal AB , Lt Purple & Lt Pink ). The Metal charms include some nature themes from the sea , garden & animal creatures. below photo shows how they would look like when attached to the wine glasses . Awesome right ? I also made some Angel inspired key Chains like the ones shown below ( This design was part of my Angel's Touch Fundraising items. ). These sparkling beauties can also be hanged by the rear view mirror of one's car to act as a guardian angel in every road trip ( I 've got one hanging by my car mirror and I even got 1 more in a much bigger size with nice silver lace ribbon hanging by my beading light infront of my beading table . I simply like the feeling of having an angel watching over me while I make my jewelries ~ see photo below ) . All you need is just add a string to hang it. See, Isn't it lovely ? Anyway, The Key Chains I made and donated for this lady's fundraising event were so pretty with Clear AB & Pink AB Crystal Beads . I'm sure people would like it and I would be more than happy to make some more to raise more funds for the Angel's Touch Fund Drive and other charities I would like to support now and in the near future like the Susan G. Komen 3-Day for the Cure , Bantay bata 163 ( Philippines ) , etc. ! Let's support Carolyn and all those walking for a cause just like her. Now is the time to give a hand to Charity. Your support to this Great Cause would be much appreciated ! I had been slowly sorting out most of the cabinets & drawers of our house in between errands and beading tutorials during the last few days and weeks. Undeniably, I had found so many things piling up everywhere ( after all these years ! ). Electrical wires ( from all sorts of electrical stuffs like phone / pc chargers ) , shoe boxes ( I had saved them for kid's school projects ) , even a collection of assorted hotel room key cards being brought home by dear hubby from his trips abroad plus a whole lot more to be categorized later once i got them recycled into something else. That's if I get lucky to have a chance to do so . I doubt that I will have the necessary time but I would try slowly though ! So ok . Let me say that these stuffs would either go to the garbage or keep them as they are. Balancing a few things in my head about throwing away ( + or - effects to the environment ) or keeping them at home ( + or - effects in our place ). Still undecided when something caught my eye and and an idea suddenly blinked somehere in my busy brains. I found this small Ziploc plastic bag containing a Brand tag made of cardboard paper , a string attached to the Tag and a piece of button. What would you normally do with this ? I hardly keep this kind of stuffs coz I don't normally use them . I don't have the habit of loosing my buttons anyway .What happens after I got them is to just put them somewhere and not to care much about it then later on it would just be thrown away. But after seeing the 3 key factors of recycling known as the " 3 R's " Reduce , Reuse, Recycle recently in the internet I had decided to do something out of this " something " that's just there right infront of me. What was I thinking ? Got it packed nicely for better presentation ! 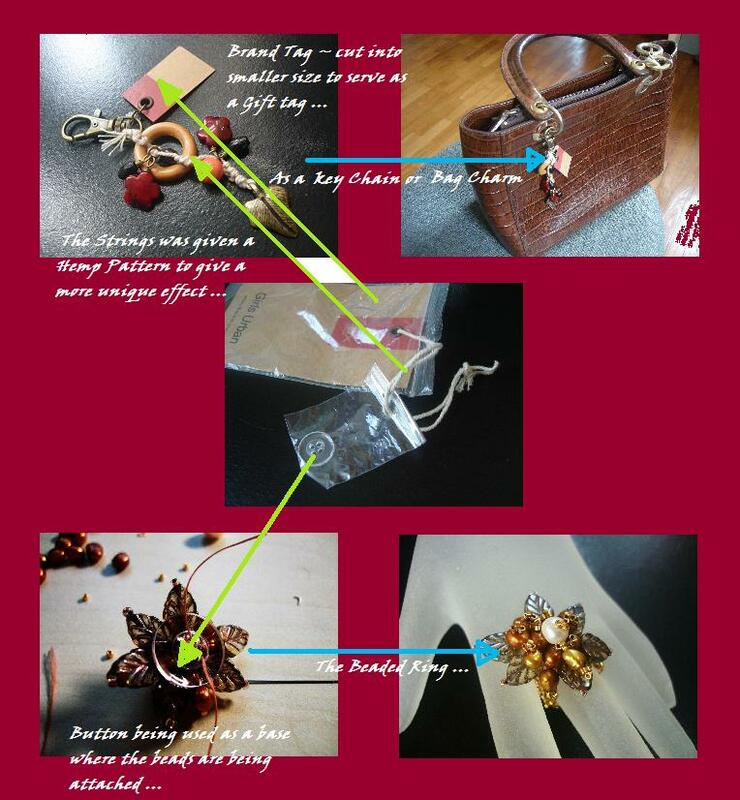 It serves as a Pretty Bag Charm too ! Now, what I had left to recycle is the single button ( the Ziploc bag was already used to keep some small beads locked in place ) . I started to choose the Pearls and Seed / Delica beads. Trial and error for the beads until I get the best sizes for the button base. I Took my size 12 beading needle and nymo thread and began stitching after I had chosen some gold color pearls and some delicas. see how I had used the single button as the base for the ring below. I just love the look & feel of this ring ! Recycling is an excellent way of saving energy and conserving the environment. So don't just throw things easily to the garbage bin. You're probably getting rid of your source of Gold instead of junk ! Pearl is a Birthstone for June, and for the astrological signs of Scorpio and Cancer. It is the traditional gift for a 30th anniversary (reflecting its historical high value), although in the modern lists Pearls are to be given for the twelfth anniversary. A pearl is a hard object produced within the soft tissue (specifically the mantle) of a living shelled mollusk. Just like the shell of a mollusk, a pearl is made up of calcium carbonate in minute crystalline form, which has been deposited in concentric layers. The ideal pearl is perfectly round and smooth, but many other shapes of pearls (baroque pearls) occur. The finest quality natural pearls have been highly valued as gemstones and objects of beauty for many centuries, and because of this, the word pearl has become a metaphor for something very rare, fine, admirable, and valuable. The unique luster of pearls depends upon the reflection, refraction, and diffraction of light from the translucent layers. The thinner and more numerous the layers in the pearl, the finer the luster. The iridescence that pearls display is caused by the overlapping of successive layers, which breaks up light falling on the surface. In addition, pearls (especially cultured freshwater pearls) can be dyed yellow, green, blue, brown, pink, purple, or black. Valuable pearls occur in the wild, but they are very rare. 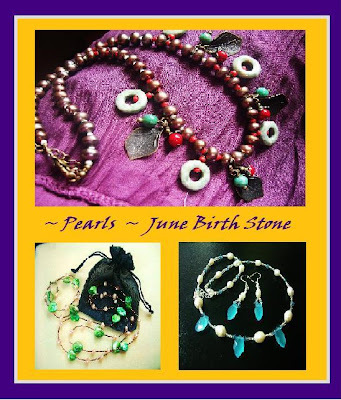 Cultured or farmed pearls from pearl oysters make up the majority of those that are currently sold. 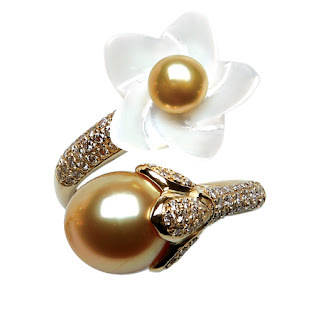 Pearls from the sea are valued more highly than freshwater pearls. Imitation or fake pearls are also widely sold in inexpensive jewelry, but the quality of their iridescence is usually very poor - and generally speaking, artificial pearls are easily distinguished from genuine pearls. Pearls have been harvested and cultivated primarily for use in jewelry, but in the past they were also stitched onto lavish clothing. 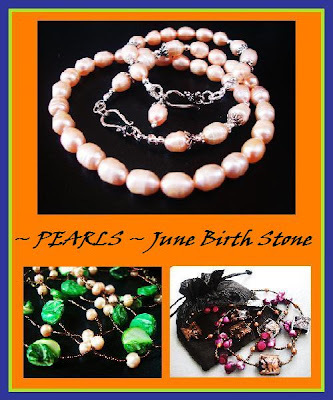 Pearls have also been crushed and used in cosmetics, medicines, or in paint formulations. For those who love the look of pearls, but don’t enjoy the price tag, Freshwater pearls are the least expensive, while remaining quite attractive. They are especially desirable for rope necklaces made of several strands which are twisted about each other or long opera-length strands. Another advantage of Freshwater pearls is their innate durability, which naturally resists chipping, degeneration, and wear. Saltwater pearls on the other hand grow within pearl oysters, family Pteriidae, which live in oceans. Saltwater pearl oysters are usually cultivated in protected lagoons or volcanic atolls. 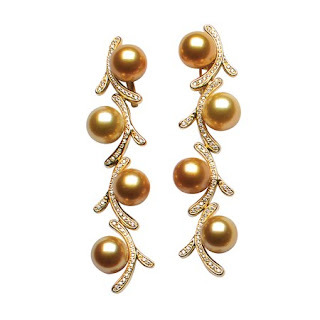 Natural pearls have always been deemed rare, and are universally costly. They are most commonly sold by their carat weight, however, most of the natural pearls on the market today are vintage pearls, as virtually every pearl producer now relies on cultured pearls. Natural pearls are simply too risky, rare, and expensive to find and sell. It is recommended that if you do have the opportunity to buy a natural pearl, you should refrain from buying it unless it comes with an official gemological x-ray certificate, which proves that it is natural, and states its quality. For something so rare, expensive, and beautiful, a little security is a must.